Those little devils appear every time I do not need them too!!! Acne is of course what I am referring to! Its like each time I have something coming up I am really thrilled about, and want to look my best, the day before BAM!!! They appear!!! And it never fails that I will be totally out of my fave mask to fight it too! So what to do? TO THE KITCHEN!!!! Wash your face with your favorite cleanser, and gently pat dry. Mix the honey and cinnamon together into a paste, and apply to affected areas. Leave on for 10-15 minutes, then rinse completely with warm water. Its also recommended steaming your face while you have the mask on to help the ingredients really get into your skin. Also mixing one part vinegar with three parts fresh, cool water and using it as a toner a few times a week. The vinegar balances the pH of your skin so bacteria can’t thrive. Then you will crave salad all the time but I will admit I need to eat salad a little more often anyway. Just saying! Next you can whip up this soothing-yet-exfoliating mask to beat acne. Yogurt and aloe are both anti-bacterial, and have skin-soothing benefits. The yogurt has lactic acid which will help exfoliate the skin and dry the breakout. Coconut oil contains lauric acid, which as also antibacterial, and almond meal gently exfoliates. All of these ingredients together will help to combat acne, and also leave your skin super hydrated. Mix the ingredients together in a bowl. Apply to your face and leave on for 15-20 minutes. Remove with a warm washcloth. This acne-fighting mask uses antioxidant-rich strawberries and exfoliating lime juice to unclog pores. Strawberries are one of the best fruits for inflammatory skin conditions such as acne as they are rich in vitamin C, which helps heal the skin and reduce inflammation. Vitamin C also helps promote collagen production for glowy skin. The citric acid in the lime juice helps whisk away dead skin and reduces bacteria and excess oil. Mash the ingredients together, and apply the mixture all of your face (including your neck). Leave on for 15 minutes and then rinse with lukewarm water. Goes great with a Margarita! 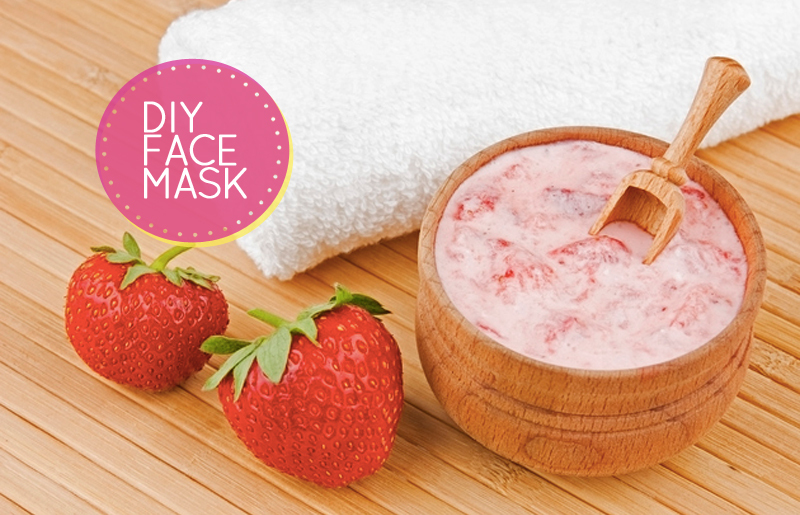 This DIY recipe for acne-free skin contains only two ingredients: strawberries and yogurt. The lactic acid in yogurt helps dissolve dead skin and tighten pores. It also has soothing, hydrating properties. Strawberries also remove excess oil from your skin. Mash the strawberries, then mix in the yogurt. Apply over your entire face, and leave the mixture on for 20 minutes. Rinse with lukewarm water. This mask has been recommended by a Registered Nurse I know for acne because it contains anti-microbial and anti-fungal baking soda (which helps absorb excess oil while gently exfoliating), plus moisturizing coconut oil and antimicrobial honey. Mix all the ingredients together until they forma a paste. Apply it over your face, avoiding your eyes, mouth, and eyebrows. Rub the paste in for one to two minutes in slow, circular motions, then leave it on for an additional 10-15 minutes. Rinse with lukewarm water. Now do not let thy fireworks be ruined by a bomb that went off on thine face!!! Get thee in thine kitchen and seekest out these simple ingredients and put them on thine face!! !